Special Report "A Million And One Weight Loss Myths"
But more importantly, what WILL shoot your weight loss results into high gear! I promise to use it only to send you Weight Loss Update. Is today the day you start losing weight for real? It doesn't cost you anything. Nada. Zilch. Not a thin dime. 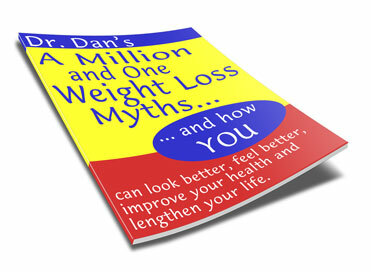 "Dr. Dan's Million And One Weight Loss Myths" is a special 27-page report. It's just packed with information that you need. It tells you everything you need to know about weight loss myths that don't work -- and about what WILL work for YOU. You'll be downloading it in a few seconds. What is a weight loss myth? Weight loss myths -- those things you tried that never worked. Everything you tried that didn't give you the results you expected. The false hopes. The broken promises. And, it's absolutely free. You'll download it to your computer in a few seconds. And you'll also be subscribed to Dr. Dan's Weight Loss Update. How do you keep on track with your weight loss? You need Dr. Dan's Weight Loss Update. Dr. Dan's Weight Loss Update is an email newsletter that brings you the latest workable tips on weight loss, fitness and health. We won't flood your email with ads. Just one simple update. Once a month. Dr. Dan's Weight Loss Update.